Today I went to work with my mom. My mom is a hair stylist and she works from home. She has a salon set up in a room on the first floor of my house that is where her clients come and get their hair done. 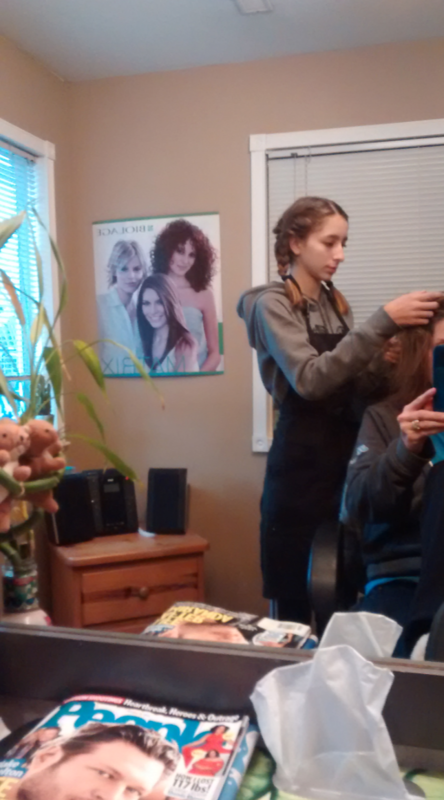 My mom’s job consists of cutting hair, colouring, stylizes, manages, cleans, and ordering products. She is the only person that works in her business. My mom is her own boss so she sets the days that she works and the prices she puts on each hair style but she likes to say that she has 150 bosses because in the end her clients determine how much she works in a day. My mom went to a collage for 1 year before training for an additional 6 months. She has been in the career for 25 years and continues to succeed with every hair style she does. Some of the things my mom likes most about her job is how she can interact with tones of people every day. In a way she could also call herself a Councillor because she listens and helps her client’s problems. She also likes how the can start and finish her job in one day unlike in some other jobs where you finish the day working on papers and picking up where you left off the next morning. The only think my mom doesn’t like about her job is when she has self centered clients, and it is also hard on her shoulders and hands, but otherwise she loves everything about what she does. Some of the skills she has to have to do this job are being able to be very open minded and accepting, she also has to be able to work good with people and she is naturally good at that. The only think my mom anticipates will change in the next five years is the different styles of hair. Today at work I washed, folded and put away the hair towels, swept the floors in my mom’s shop, washed and dried hair, and mainly just cleaned up around the shop because I can’t cut or colour hair without the proper training. I do not think that I will be a hair stylist in my future because although I aspire to get into a creative hands on job/career in my future hair styling does not interest me as some other jobs do. I really like how you get to interact with so many different people in this job and how by the end of the appointment you can make someone feel so good about themselves. I also like the fact that you have to be creative with your work. Some of the things I don’t like as much is the fact that you have to touch other people’s hair. And I would be very scared of messing up someone’s hair or them not liking the end product. You need to have a lot of confidence and strength to go into this job, hence another reason why I would not like this job. This day is an important thing to participate in because kids need to start realizing that you need to be educated to give you more career options to choose from. If kids go through life doing the bare minimum just to be able to graduate high school, most collages and universities will not accept you. There for you will not get into a very good career.